Well shoot me, but I wanted to squeak in one last summer recipe. After all that about the transition into autumn (see previous post) you may think I'm nuts (and I am) but believe it or not, we are still picking tomatoes from the garden! Anyway, let's kiss summer goodbye with this one. This recipe is summer at its best. It is so fresh and so tasty and so versatile. It is possible with this salad to add pretty much anything that is in season to it, and it will still turn out good. 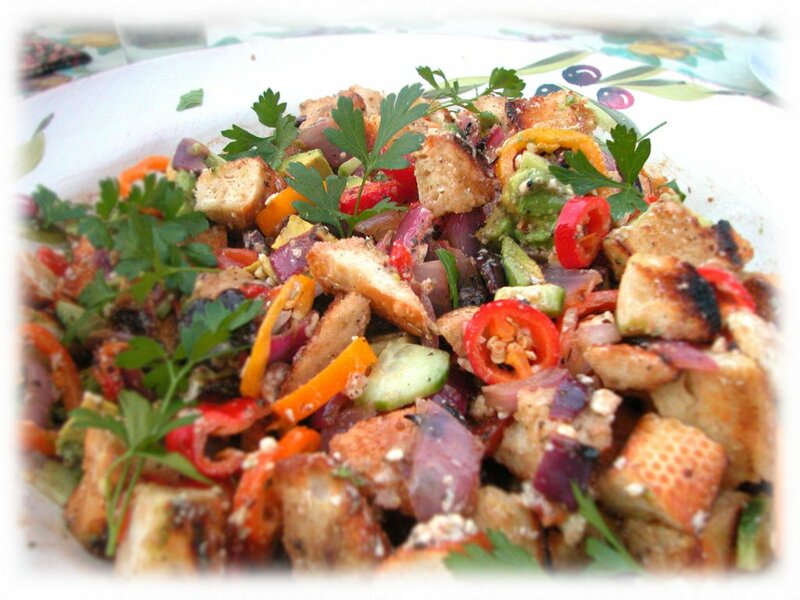 Grilling some of the ingredients in this salad make it a real treat. I even like to marinate some of them before grilling! This salad is one of our family favorites, and I really think you will enjoy it a lot. Slice the bread into 1 in. thick pieces then lightly butter both sides of each slice (some garlic added to the butter is really good). Grill or broil the bread until somewhat crusty and golden. If you don't toast the bread it will absorb too much of the dressing and become soggy. Grilling the bread adds a wonderful smoky flavor to it as well. This can be done on the grill or underneath the broiler. Charring the pepper does a really neat thing to the flavor and texture of the pepper, and I use this technique quite a bit. If you want to skip this step, the supper market does sell jarred peppers under the label "roasted red bell peppers". 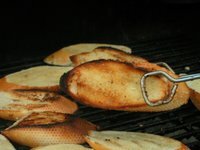 If you are doing it on the grill, simply place it there and turn it until all sides are burnt. Don't worry about it turning black...that is the point. If you do this underneath the broiler, halve and seed the pepper before you char it. Take it off the grill and put it in a ziploc bag or container and seal. This loosens the skin for peeling and also softens the texture of the pepper. Peel the pepper then halve it and remove the seeds. Chop it into a 1/2 in. dice. 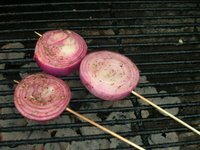 lollipopping the onion is so that it doesn't fall apart on the grill. Simply insert a sk ewer threw the rings until it pokes out the other side. Be careful not to poke yourself. If you do two onions with one ring on each skewer you'll need four skewers. If you wanted to marinate them (recommended) put them in a ziploc bag with some olive oil, red wine vinegar, garlic, salt, pepper, and maybe some herbs and let them marinate for about a half hour before you grill them, flipping the bag halfway through. I also like to smother them with balsamic vinegar while they cook (onions done this way are one of my favorite things to grill and make a great side dish by themselves). When they are sufficiently grilled take them off and chop them. When all the other ingredients and the dressing are all prepared (chopped, diced, sliced, etc), toss everything in a serving bowl and serve. In case these are unfamiliar to some of you I thought I’d talk about them a little. 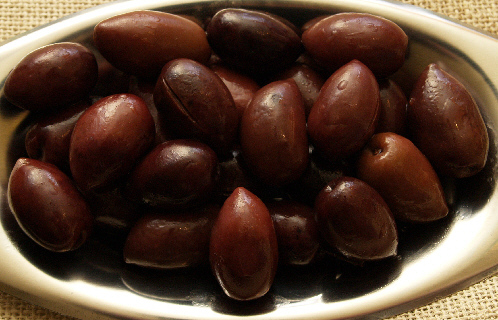 Calamata (or Kalam ata) olives originated in Greece and are largely used in its cuisine. They are purplish-black in color and almond shaped (about 1/2 to 1 in long). They are often packed in a wine vinegar marinade and have a wonderful rich and fruity flavor. 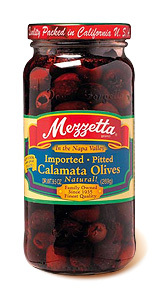 Mezzetta® is a good brand and they are widely available in stores, but real imported ones are the best if you can find them. Pitted olives are time savers if you were to cut them, like you would in the salad. The olives still with the pits, frequently have a slit in them to absorb the flavor of the marinade in which they are soaked. I just realized my comment settings were only allowing registered users to comment. Now anyone can comment! How about that?